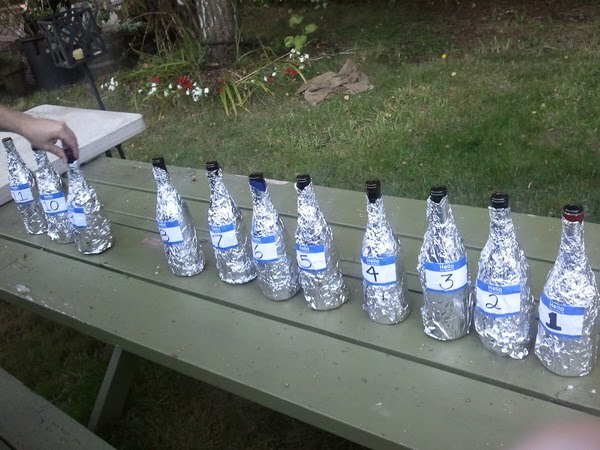 Some friends at Wine & Beer of Washington State recently hosted a blind tasting of Washington Pinot Noirs, inviting an assortment of wine bloggers and twitterati. Many of us dubious, given that “Washington” and “Pinot Noir” aren’t often found in the same sentence. Bean Fairbanks and the Wine & Beer of Washington State crew had put together a line up of twelve Washington Pinots and one "ringer" from Oregon. 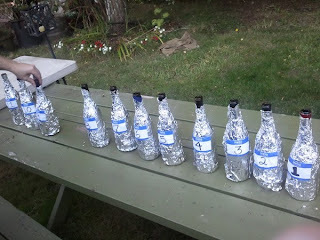 With the foil wrapped bottles lined up in front of us, we went to work. While there was some scoffing and smug remarks about the ability of Washington to produce a worthy Pinot, these were serious Northwest wine drinkers. All kidding aside, The Washington Wine Report's Sean Sullivan and myself had both previously had the opportunity to experience the Kyra Pinot, and we both found it to our liking. So while no one is ready to demand that Oregon's Willamette Valley fork over their title as America's Best Pinot Producer, (yeah, California, I said it) we knew that there was potential out there for this varietal in Washington. In addition to the Kyra Wines Pinot, word on the street (and in the newspapers) was that very good things were happening with the Pinot Noir from James Mantone down in the Columbia Gorge at Syncline Wine Cellars. Below I submit my quick thoughts from the evening. Some of them are a bit rough, but this was how these wines tasted to me on this particular evening. Wine #1: Pinot is not really supposed to have tannins like this. Lots of wood? Wine #2: Not much palate on this wine. There's not much going on. Anyone home? Wine #3: Whoa, oaky dokey. This wine is quite harsh. Tastes like it might be oxidized or a port style wine that's been open a long time. Wine #4: Now that's a Pinot, finally. Cherries and cranberries on the palate. Wine #5: Very good. Might be the Kyra. Baked cherries, concentrated fruit, restrained use of oak but some toasted almond elements. Wine #6: This has got to be the Oregon Pinot, best one of the bunch. No oak to speak of, beautiful Pinot Noir. More please. Wine #7: This wine has a lot of green elements, not so much oak to speak of; a relief. I'm getting sour cherries. Wine #8: Sheesh. This wine, what is the deal? Tastes like strawberry daiquiri mix, and unripe rhubarb. Wine #9: Fairly concentrated, judicious use of oak, a pretty solid example of Pinot Noir. Wine # 10: Hmm...Bo Derek has nothing to worry about. Way too much oak on this wine, no hope at tasting the fruit. Cherry Halls comes to mind. Wine #11: A bit of an earthy and musty nose, aromatic wine. Flawed? Brettanomyces? Wine #12: A rosé. Fairly good acidity with grapefruit and other citrus notes in the wine. So the verdict? My favorite wine of the night was easily the Syncline Pinot or #6. You know, the one I said had to be from Oregon. This Pinot, produced in the Columbia Gorge from the Celilo and Underwood Mountain vineyards, was the consensus winner from every guest. The restraint on the oak and the old world approach that James Mantone uses with all of his wines really lets the fruit and terroir speak for itself. This approach, which is often referred to in this country as Burgundian, is also typically Oregonian - at least, in what I feel are Oregon's finest examples. Second place? Kyra Wines 2008 Pinot. Not much of a surprise. Actually, I was thrilled that I guessed this wine correctly. That rarely happens for me in blind tastings. It’s a bit more heavily oaked than what I prefer from Oregon, but it's not overly done. The fruit is certainly present, the concentration is good, and Kyra does a good job of blending multiple vineyards. The Kyra 2007, which was also in the lineup this evening, didn't fair as well. This was the vintage I'd had before, and I suspect that in this case this particular bottle may have been a bit off. Third place? This was my biggest surprise of the evening, except perhaps for the fact that the Oregon Pinot faired so poorly. Third place went to the Challenger Ridge 2006. While it didn't approach the other two it was a solid Pinot Noir. I was particularly impressed given this one came from the Puget Sound AVA, which has some unique weather challenges to wine growing. Similar to the Syncline this wine allowed the fruit to come out and really backed down on the oak. Similar to the Kyra there was a vast difference in opinion between vintages from the Challenger Ridge, the 2005 was not very impressive at all. At the end of the evening, as we prepared for a beautiful dinner, the conclusion of the group - besides that the food looked amazing - was that Washington can indeed produce Pinot Noir. However, there isn't yet a consistency in quality like what you'll find in our neighbor to the south. That might come, and it might not. In the case of Syncline, making wine from a cool climate like the western end of the Columbia Gorge may be the ideal situation, but Kyra and Challenger Ridge certainly prove that the wine can come from all over the state. Stop asking questions and give some of it a try. I have heard that Syncline makes great wine. I'm excited to get my hands on it now. Which Oregon Pinot Noir did they add to the pool? I bet if an Oregonian was among the tasting they could have deciphered. At least in my case, home palate runs deep. Hi there! Congratulations on your site! You have a way with words for describing the taste of the wines. Cheers to that!